Cleansers There are 27 products. Soothes, balances skin moisture and helps to control oily secretions.Prepares the skin for further cosmetic treatment. Refreshes, soothes and softens the skin. Provides intense hydration, works to improve blood circulation and to stimulate the function of cells. Prepares the skin for further cosmetic treatment. Ultralight micellar gel. Contains lactobionic acid. Gently and effectively cleanses every type of skin. Softens and smooths the epidermis.Does not disturb appropriate moisture level. Creates soft foam and provides feeling of freshness. Cleanses the skin and completes make-up removal. Reduces dilated pores. Contains organic acids with gently exfoliating activity. Helps soothe acne lesions. Prepares the skin for further cosmetic treatments. 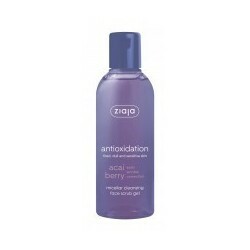 Purifying cleansing gel. Perfectly cleanses the skin. Soothes irritations and skin redness. Moisturises and softens the epidermis. Prepares the skin for further cosmetic treatments. Soap-free.